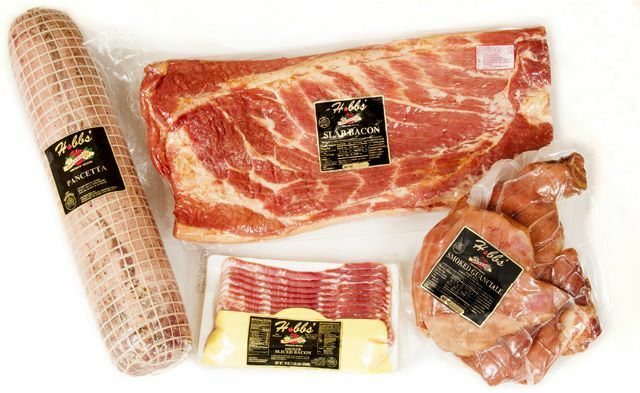 Hobbs' Applewood Smoked Bacon, sliced or slab, is one of our signature offerings. Our "California Style" bacon is cured and sweetly smoked to enhance the pure pork flavor, which translates into rich, redolent taste. 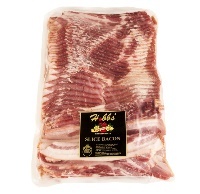 Hobbs’ bacon is center cut with 2 lean streaks, and carefully crafted to assure superior texture and consistency. "Little Pillows" Italian style smoked bacon squares. Great in Carbonara! For the Chef at Home, with the same exact Hobbs’ quality you will find at many of North America’s finest restaurants. Our Rustica Pancetta, or Italian Bacon, is a lean pork belly with an aromatic rubbing of herbs and spices which are "bedded down" in order to develop a truly superior product. Next it is rolled and dry cured to intensify its flavor. Hobbs’ Applewood Smoked Bacon cured and smoked with a delicate coat of fresh cracked peppercorns. Same sweetly smoked bacon as our Signature Offering which is best suited for small piece use such as salads and pizza toppings.